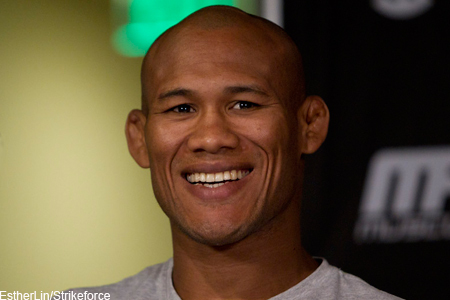 Ronaldo “Jacare” Souza (pictured) submitted his application for next crack at the UFC middleweight title by beating Francis Carmont Saturday night. While Jacare’s unanimous decision (29-28, 29-28, 30-27) victory over Carmont was a solid notch on his belt, it likely won’t solidify his spot for a shot at the gold belt. The UFC’s middleweight division has surprisingly become one of the promotion’s deepest, so, as UFC president Dana White loves to say, we’ll see what happens. After the win, Jacare revealed he injured his arm in training but refused to pull out of the shootout. Props for that.